Annette Funicello, the 60's wouldn't be complete without a mention of her. And other than her role as a mouseketeer, this is how I always remember her. At the beach or in some sort of swimsuit. Love this shot. The skirted bikini is by Givency from 1969. It just works so well together paired with the floppy hat. 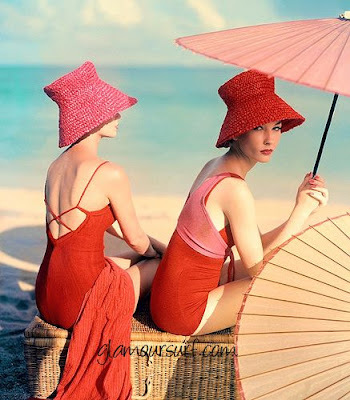 This image is from 1953 and I would bet that is a Claire McCardell or Josete Walker swimsuit. 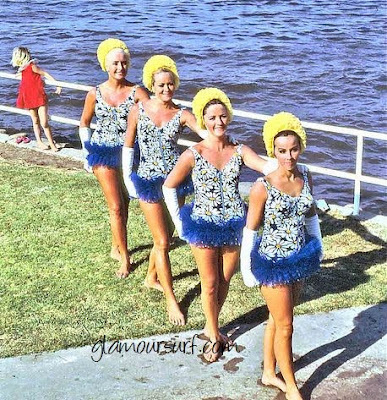 More aqua beauties from the 1960s. I'll be the young gal in the background is wishing she has one of those tutu's. The gloves are an added twist. Space age fashions were big in the 60s. This swimsuit comes complete with socks and a helmet.